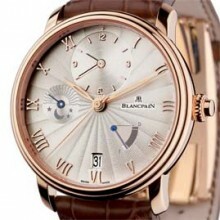 In 2011, Blancpain is pursuing the reinterpretation of its Villeret collection initiated in 2010. The Manufacture du Brassus is offering an exclusive preview of its first Villeret Demi-Fuseau Horaire, a model that serves to adjust the second time zone in half-hour increments. Travellers to countries with half-hour time-zone differences, such as India, will thus be equally punctual while in those particular destinations! 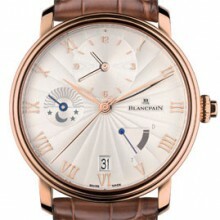 Blancpain’s first ever dual time-zone model is extremely user-friendly. A few turns of the crown are enough to perform all adjustments on this watch: date, time zone and reference time. A pusher located on the head of the crown serves to select fast correction or half timezone adjustment mode. It is worth noting that correcting the reference time automatically modifies that of the second time zone. The smooth and easy handling of this half-time-zone function is the physical expression of the ingenuity displayed by the Manufacture in Le Brassus in developing its Calibre 5254DF. 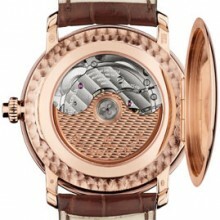 This new 321-part self-winding mechanism is endowed with a 72-hour power reserve. It displays the reference time at 12 o’clock; the half-time-zone and seconds in the centre; the day/night indication for the reference time at 9 o’clock; the date which changes in step with the second time-zone at 6 o’clock; and the Date Change (D) or Time-Zone (F) indication at 4 o’clock. It is a further demonstration of Blancpain’s incredible spirit of innovation and now takes its place in the brand’s movement parade that began in 2006. The Villeret Demi-Fuseau Horaire features a half-hunter case in red gold fitted with a sapphire crystal case-back revealing the finesse of the movement and of the guilloché work oscillating weight. The subtly engine-turned opaline dial is enhanced by red gold hourmarkers, and the watch is fitted with an alvazel-lined leather strap.